Mango puree (76%), cane sugar, water. 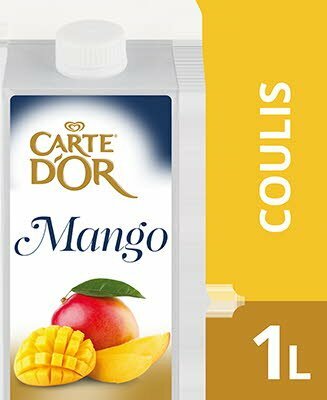 SERVING SUGGESTIONS Carte D'Or real fruit Coulis is a ready-to-use product and requires no dilution or other method of preparation. You can use it as a superior cold topping (on ice cream for example) or hot for a deliciously different dessert sauce. You can also combine the Coulis with finishing sauces, such as Jus, to add a delicious fruit flavour. TO OPEN Crack the airtight seal from the cap and pour the fruit Coulis directly from the pouch. To reseal, reverse the cap and fit securely onto the nozzle. Store unopened packs in a cool dry place. Once opened, keep refrigerated between 0°C and 4°C. Use within 8 days.